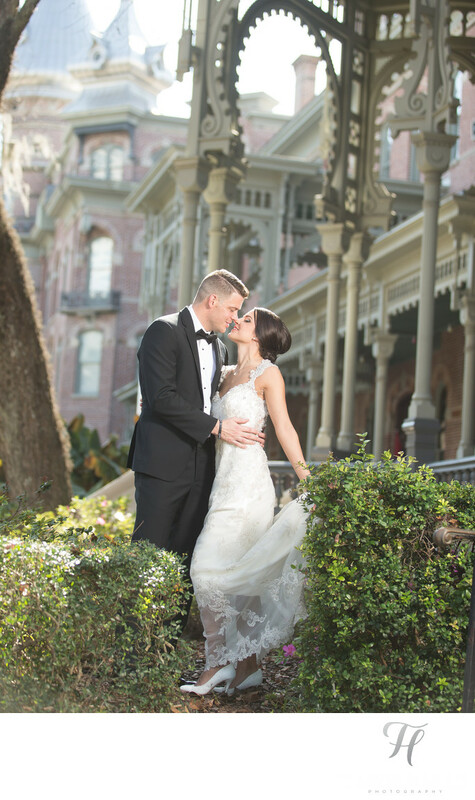 Someone told me that this was one of the Best Tampa Wedding Photos out there, and I said.. Thank you! All of this becomes so subjective, but it's true that I work harder then most to get results that are actually worth me sitting here typing about. Alright guys.. "I need you to get into the bushes” LOL. Yes, this is what I said, and it was pretty funny. But, they knew that I would make this well worth it. The striking thing about this shot is the location in the back. It was Tampa University. The key to make it look like it does in this image, was to use massive compression from the lens. I shot this at 200mm from far away, and then simply filled the frame with my subjects. THIS is what made the background look "bigger then life" and seemingly "on top" of them. The other thing that is just perfect here is the lighting. I have the sun working with me well, and is cross lighting the building, and this is amplifying the texture and dimension. It's also giving my clients a nice "rim" light and allows them to be very "separated" from that background. This was an important consideration, and I was lucky in the sense that I had (and saw) ALL of this coming together when out in the field. I have other versions of this same shot, but liked this one the best of the almost kiss. To see more from this wedding on my blog click here. To see more of Tampa University click here. Location: 401 W. Kennedy Blvd. Tampa, FL 33606.